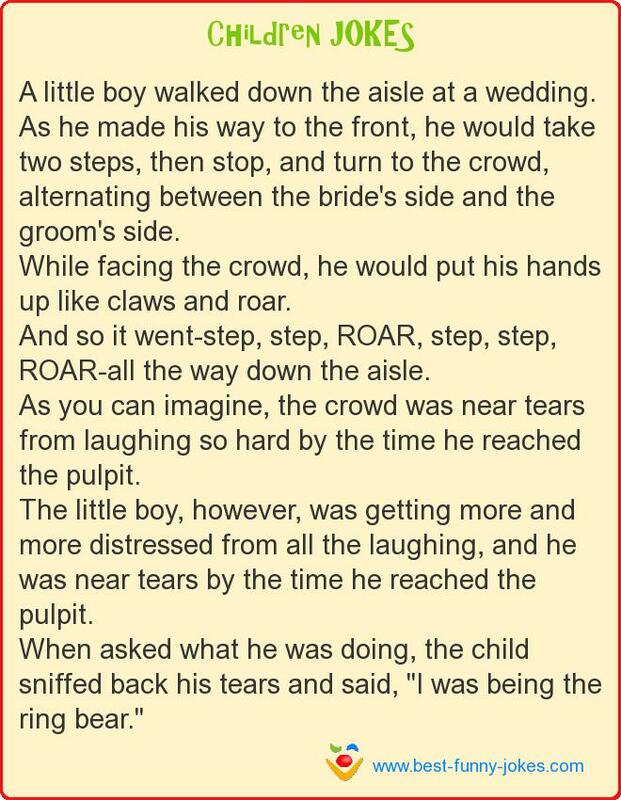 A little boy walked down the aisle at a wedding. As he made his way to the front, he would take two steps, then stop, and turn to the crowd, alternating between the bride's side and the groom's side. And so it went-step, step, ROAR, step, step, ROAR-all the way down the aisle. As you can imagine, the crowd was near tears from laughing so hard by the time he reached the pulpit. The little boy, however, was getting more and more distressed from all the laughing, and he was near tears by the time he reached the pulpit. When asked what he was doing, the child sniffed back his tears and said, "I was being the ring bear."